Meeting Thursday in Hilo, the state Board of Education debated three crucial budgets, eased implementation of the weighted student formula and recognized the charter schools' volunteer and educator of the year. The board first had to weather pointed and at times personal criticism by charter school supporters over the dismissal of Jim Shon, the former executive director of the Charter Schools Administrative Office. Those who braved Thursday's lightning storm stood in the rain at the entrance to Waiakeawaena Elementary School, holding signs. Others, prevented by the 150-person capacity of the school cafeteria, held up their signs outside. 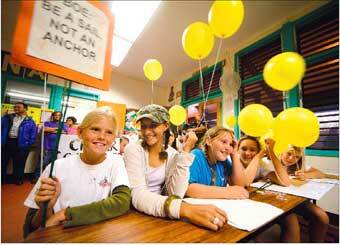 Parents, teachers, students and charter school administrators were armed with yellow helium balloons and signs that read "Small schools are cool" and "BOE be a sail, not an anchor" in block letters, hoisting them above the crowd. "I really see that the recent actions of the board were not in the best interest of charter schools," said Prana Mandoe of Hilo, lead teacher of Kua O Ka La Public Charter School. She said Shon's firing and delayed action on funding was "directly and negatively affecting the education we are giving our students." Her comments were echoed by others during nearly 90 minutes of public testimony. Another member of the school, administrator Susan Osborne, said that a Honolulu newspaper had quoted board member Cecil Heftel as saying it did not matter who headed the charter schools. Heftel said that report was false, adding that "for reasons I don't understand, I did not participate" in Shon's firing. That drew a caution from board Chairman Randall Yee regarding comments made in executive session. Heftel replied that his comments were related solely to Osborne's comments, prompting a second warning from Yee. Those in attendance applauded and shouted, "Thanks, Cec." Several students also testified about the change that charter schools have made in their otherwise troubled lives. One woman at Volcano Public Charter School suggested that board members follow some of the basic teachings that charter school students learn, such as honesty, listening and even making eye contact. "What school do you go to?" she snapped, prompting more applause. Board member Mary Cochran, upset by recent news reports about the BOE, asked Chairman Yee that confidentiality be waived so the reasons for Shon's firing could be revealed. The request was denied. The board did, however, unanimously approve the operating and capital improvement project budget request for the Hawaii State Public Library System. The board's Committee on Budget and Fiscal Accountability recommended additional general funds of $1.86 million in the fiscal year 2007-2008, and $1.82 million in the year after that for operating cost increases. Board members, after debate, approved by a 9-3 vote a proposal regarding the weighted student formula. The formula allocates a certain amount of money to public schools depending on the economic status, geographic location and size of each school. But fully implementing the formula would result in drastic budget cuts to many schools. The proposal adopted by the board continued implementing the weighted student formula at 15 percent of the total formula for the school year 2007-2008. "It is my opinion that we are effectively gutting and killing the weighted student formula," said board member Paul Vierling, explaining his vote against it. He said deferring the cuts would require a 75 percent cut to some schools in the next year. Konawaena Middle School became the Big Island's top beneficiary of a revised capital improvement budget the board approved, along with $215 million next year to improve all schools statewide. The Kealakekua school's $9.3 million request for a locker/shower building was ranked 27th on the list of priorities, which must still be included in Gov. Linda Lingle's executive budget and the legislative appropriation process before Lingle releases the funds. Before the CIP vote, Big Island board member and First Vice Chairman Herbert Watanabe made a successful motion to shift $804,000 from the state lump sum for building temporary facilities into the lump sum for staff costs. Much earlier in the day, the interim executive director of the Charter School Administrative Office gave her report, which was admittedly brief because she had only been on the job since Sept. 25. Vanelle Maunalei Love began by voicing regret on behalf of the charter schools over the firing of Jim Shon, the former executive director. "Our charter school community feels basically as if they lost a member of their ohana, and I have to say that because I do represent the charter schools," Love said. She also asked that the charter school budget report be submitted and approved. "I'm hoping to act as a connection, as a link between the Department of Education and the charter schools. That is very important," Love said. One woman drove over from Kailua-Kona to express her displeasure with the board. "I'm a parent of an Innovations Public Charter School student and we're upset with the decision the BOE made to fire Jim Shon," Julie Pai said in the afternoon session, before the dinner break. "We feel that the decision was disrespectful to the charter school system and the community. It showed that the board does not support positive school reform, so charter schools no longer want the BOE to oversee charter schools. They'd like to see another public entity. "We feel charter schools are the hope of Hawaii's children, and the decision to fire Jim Shon despite the success that he's achieved was unwarranted, and it showed they do not support charter schools and it upset a lot of us," Pai said. She hoped that the board would reinstate Shon. The planned major rally for charter schools was dampened by Thursday's thunderstorm and by the surprise announcement Wednesday that the board would not be voting on the charter school budget. It was the second time it's been deferred. Chairman Yee said it would be ready "within the next two weeks." He also declined to comment on the Shon matter. The BOE's next general meeting is scheduled on Oct. 19 at Pearl City High School on Oahu. John Bush, a teacher at Volcano Public Charter School in Kapoho who also teaches technical classes at Na Kua O Ka La, voiced his support for charter schools while the board met in executive session. "I'm here because I'm a concerned teacher and realize that the charter school system needs to gain as much support as possible for the charter school mission of basically forging new ground in education," Bush said. He told how one of the directors of his school called it a "research and development arm of the educational system." "It means that the charter schools are actually pioneering new techniques, and they have the flexibility to try new approaches to education, and we're able to find out what works and what doesn't work." Bush also praised Shon as an "extremely effective executive director" and called his firing "a great blow to the system." Peter Sur can be reached at psur@hawaiitribune-herald.com.